1500 Year Old Bible Claims Jesus Christ Was Not Crucified – Vatican confirms dismay in awe ? 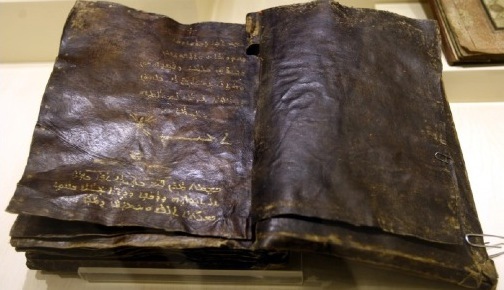 the book contains the Gospel of Barnabas – a disciple of Christ – which shows that Jesus was not crucified, nor was he the son of God, but a Prophet. says that the Bible was seized from a gang of smugglers in a Mediterranean-area operation. The report states the gang was charged with smuggling antiquities, illegal excavations, and the possession of explosives. The books itself is valued as high as 40 Million Turkish Liras (approx. 28 mil. Dollars). Man, where is the Thieves Guild, when you need them? The text maintains a vision similar to Islam, contradicting the New Testament’s teachings of Christianity. Jesus also foresees the coming of the Prophet Muhammad, who would found Islam 700 years later. 1500 Year Old Bible Claims Jesus Christ Was Not Crucified – Vatican In Awe |Higher Perspective. The pope the pope. He is about as much a Christian as an atheist. This pope is a friend to antichrist and an enemy of the true church of Christ. This pope is a sstanist.